Exposure to pesticides used on common kid-friendly foods has been linked to an attention disorder. Exposure to pesticides used on common kid-friendly foods — including frozen blueberries, fresh strawberries and celery — appears to boost the chances that children will be diagnosed with attention deficit hyperactivity disorder, or ADHD, new research shows. Youngsters with high levels of pesticide residue in their urine, particularly from widely used types of insecticide such as malathion, were more likely to have ADHD, the behavior disorder that often disrupts school and social life, scientists in the United States and Canada found. Kids with higher-than-average levels of one pesticide marker were nearly twice as likely to be diagnosed with ADHD as children who showed no traces of the poison. “I think it's fairly significant. A doubling is a strong effect,” said Maryse F. Bouchard, a researcher at the University of Montreal in Quebec and lead author of the study published Monday in the journal Pediatrics. Diet is a major source of pesticide exposure in children, according to the National Academy of Sciences, and much of that exposure comes from favorite fruits and vegetables. In 2008, detectable concentrations of malathion were found in 28 percent of frozen blueberry samples, 25 percent of fresh strawberry samples and 19 percent of celery samples, a government report found. Bouchard’s study is the largest to date to look at the effect of pesticides on child development and behavior, including ADHD, which affects an estimated 4.5 million U.S. children. About 2.5 million kids take medication for the condition, according to the Centers for Disease Control and Prevention. Bouchard and her colleagues measured levels of six pesticide metabolites in the urine of 1,139 children ages 8 to 15 selected from the National Health and Nutrition Examination Survey between 2000 and 2004. The study included 119 children who were diagnosed with ADHD. Unlike other studies of pesticides’ impact, Bouchard’s sample provided a glimpse into average insecticide exposure in the general population of children, not a specialized group, such as children of farmworkers. Because certain pesticides leave the body after three to six days, the presence of residue shows that exposure is likely constant, Bouchard said. She found that kids with a 10-fold increase in the kind of metabolites left in the body after malathion exposure were 55 percent more likely to be diagnosed with ADHD. Because the researchers didn't review the kids' diets, they couldn't say why some children had such high levels of pesticide residue. Children are at greater risk from pesticides because their young bodies are still developing and may not metabolize chemicals as well as adults'. The most alarming finding was a near-doubling in odds of ADHD diagnoses among kids with higher-than-average levels of the most common of the six metabolites detected. Kids with high levels of dimethyl thiophosphate were 93 percent more likely to have the disorder than children with with undetectable levels of the marker. The research may add to anxiety about ADHD, which has no known cause, said Dr. Andrew Adesman, chief of developmental and behavioral pediatrics at the Steven and Alexandra Cohen Children’s Medical Center of New York. “It does seem to suggest that at non-extreme or more typical levels, there does seem to be some increased risk,” said Adesman, who is on the professional advisory board for Children and Adults with ADHD, an advocacy group. Boucher studied organophosphate pesticides, which account for as much as 70 percent of the pesticide use in the U.S. They work by interfering with the nervous systems of insects, but have a similar effect in mammals, including humans. Most people in the U.S. have residues of the products in their urine. Cheminova, the Danish firm that is the leading manufacturer of malathion in the world, declined to comment on the conclusions of the new research. Diane Allemang, vice president for global regulatory affairs, said she hadn’t seen the study. Parents of children with ADHD, however, said Bouchard’s work will give them one more than thing to worry about. “We’re all completely obsessed with food,” said Jamie Norman, 32, of Freeburg, Ill., whose 6-year-old son, Aidan, was diagnosed with ADHD six months ago. The stimulant medication Aidan takes, Adderall XR, depresses his appetite, so Norman said she’s always trying to find good foods that he’ll want to eat. Other parents of kids with ADHD choose to use diet, not medication, to control the disorder and they’re constantly monitoring food, too. News that some of the best foods for kids might be tainted with something linked to ADHD is worrisome, Norman said. 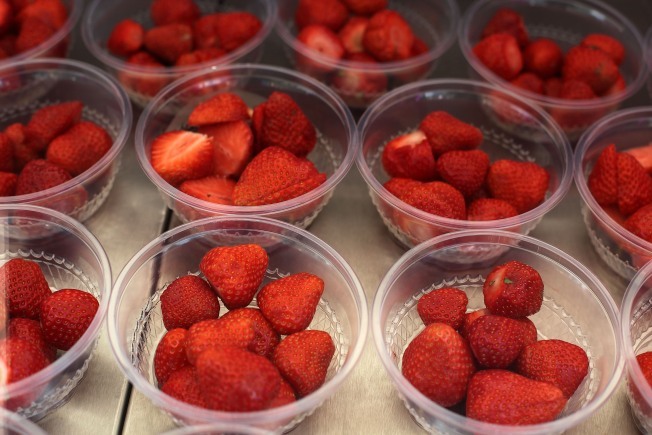 “I’ve known for some time that strawberries, in particular, contain high levels of pesticide, but as far as frozen fruit, I don’t give that a second thought,” she said. The best advice for parents — and anyone who wants to avoid pesticides — is to choose foods least likely to contain them. The Environmental Working Group, a consumer advocacy organization, advises shoppers to buy organic versions of a dozen fruits and vegetables that grow in the ground or are commonly eaten with the skin, because they’re most likely to be contaminated. Make sure to wash all fruits and vegetables under cold running tap water and scrub firm-skinned produce with a brush. Be sure to rinse frozen fruits and vegetables, too. But don’t wash produce with soap. The Food and Drug Administration says that could leave behind residues of detergent, yet more chemicals that everyone would do best to avoid.